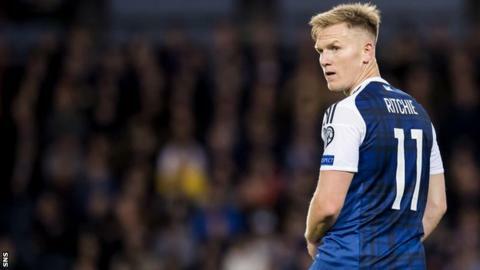 Midfielder Matt Ritchie says Scotland know they need to get "maximum points" from their final four World Cup qualifying matches. Gordon Strachan's Scotland sit fourth in Group F, four points behind second-placed Slovakia as they look to earn at least a play-off spot for Russia 2018. The Scots visit Lithuania on Friday, host Malta three days later and face Slovakia and Slovenia next month. "We know what we have to do," said Ritchie. "We've looked at the numbers. We know that it's important to get maximum points, but we go into every game hoping to win the game and preparing as if we want to win the game. "Hopefully, performance can be good and with a good performance normally comes a victory." Ritchie, who played most of Newcastle United's 3-0 win over West Ham on Saturday, agrees with Strachan's view that the squad is in more confident mood following the performance in June's 2-2 draw with England. "Obviously, I missed that meet-up," said Ritchie. "I've come back into the fold this time. You can feel that there's a belief that we can get the points we need. "It's fantastic to get points on the board. Whether it's club football or international football, if each individual player turns up and is confident and enjoying football, the group will only be stronger. "So, it's good that we've had a positive result at Newcastle and there's other lads that have had positive results as well, so hopefully the confidence throughout the group individually is high. "Playing international football, there's always the pressure. The expectation is huge and the lads know that. We have to be able to handle it and that's part and parcel of being an international player." Strachan said of Ritchie: "He should be confident because he is playing very well. He's in a better place than he was a couple of months ago. A couple of injuries held him back. "He had a good season last year and what we've seen this year he's in a good place. When you get a win in the Premier League like he did, when you see the [wet] conditions we trained in, he believed it was nice and sunny. That's what happens when you win game of football."